Prolific anime art director and background artist Hiromasa Ogura (Patlabor: the Movie, 1989; Ghost In The Shell, 1995) will lead a masterclass studio experience for early career animators and illustrators. In this rare intensive workshop, Ogura will demonstrate manual rendering processes and share original, pre-digital techniques for animation backgrounds. Participants will work to develop their own background illustration and have the opportunity to receive feedback from Ogura during the workshop. Please note that this masterclass will not explore digital painting. Due to the nature of the content, this event is open by portfolio application only to early career artists, professionals and students of animation and illustration. 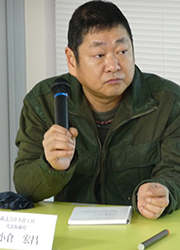 Born in 1954, Hiromasa Ogura is a graphic artist and designer of backgrounds and concepts for animated films and computer games. He started working in anime at Kobayashi Production 1977; in 1983 he left and establish Studio Fuga with Hiroshi Ono and Toshiharu Mizutani. From 1995 to 2007, Ogura was the head of the Art Department at Production I.G, from which he established his own firm, Ogura Koubo. With a close working relationship with director Mamoru Oshii since 1987, Ogura was art director for Patlabor: the Movie (1989) and Ghost in the Shell (1995), which feature in the exhibition Anime Architecture. He was art director for Ninja Scroll (1993) and several films and anime series. Ogura also worked in the animation department on films The Girl Who Leapt Through Time (2006), Ghost in the Shell 2: Innocence (2004), Spirited Away (2001), The Castle of Cagliostro (1979), Jungle Emperor Leo (1997) and many more. Applications for this Masterclass event have now closed. Please expect to hear from us soon with the outcome of your application, and thank you for your interest. This workshop will involve manual rendering processes (hand draw, hand-painted) and will not involve any digital techniques. Materials needed will be specified in the confirmation email to successful applicants. $45 (+ booking fees), limited to 16 participants only. Prospective participants are required to submit an application, which is free of charge. Applications close 20 July, 12pm. Successful applicants will be notified on 23 July. Header image: Background illustration for Ghost in the Shell (1995). Illustration by Hiromasa Ogura © 1995 Shirow Masamune / KODANSHA · BANDAI VISUAL · MANGA ENTERTAINMENT Ltd.